So, this is the mass-market release of the character first made available in the SDCC two-pack, but it's not just a repaint: where that figure was wearing his cape down across his chest, this one (and, in fact, every other release of the guy) has the cape up over the shoulder. That means a new chest cap, but all the other add-ons - the goat legs, the waist, the gloves, the head, even the shield and sword/scabbard - are all the same, but he also gets a pair of bare arms you can swap on, for those times you want to take his chest armor off. The colors are a ton more vibrant on this release: yellow and black instead of gold and silver. At home in even the harshest climates, Vachonus and his band of marauders seek to capture the renegade Vorin and his friends in order to collect the bounty on their heads. Vachonus is a scorpion - and props to everyone involved for not just naming him Scorpius or something. His name is actually a rather clever reference: "vachon" is French for "cowherd," which may not seem very scorpion-y, but Max Vachon was a French zoologist who wrote Etudes sur les Scorpions, a 1952 study on the arachnids of North Africa. That's a Dennis-Miller-like level of obscurity! 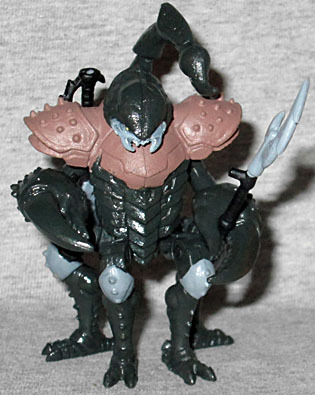 There's a normal Minimate body at the core of all the Battle Beasts, but in Vachonus' case, that means only the torso, arms and thighs: everything else is new. He has large claws instead of hands, which would be really cool if the spots where the arms plugged in weren't so shallow, meaning the claws fall off easily. 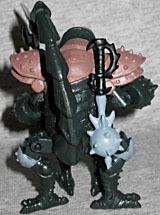 His chitinous torso and the spiky armor he wears on his shoulders are a single piece, and there are swivel joints his head head and tail. To give him extra legs, he has a new waist block with four hip joints, and his legs (from the knees down) are new. He's armed with a spiked mace and a hooked polearm, both of which can be held in his claws, or plugged into his back (one at a time). In order to make back some of the money being spent on all these new molds, the Battle Beasts had TRU-exclusive repaints, half of them representing different characters. 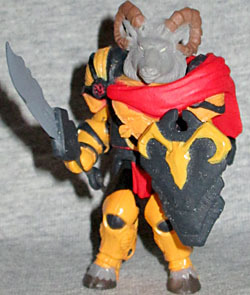 TRU Vorin has colors closer to the SDCC release, while the TRU scorpion, Scorpus, is brown with black armor, rather than black with brown armor. Which set you prefer is up to you.